Well done to all of the finalists and congratulations to the winners of each category. Meantime, in the South Alicante Winter League Quesada Pearls played La Siesta Apollo’s and won the match 10-2 with shots 135-73. A great result which moves them up to 3rd place in the league. Quesada Diamonds travelled to Emerald Isle to play the Titans, who won the match 8-4 and shots 98-69; and the Rubies had a hard tussle against Emerald Isle Moonrakers this week, who won 8-4 and shots 102-90. In the Southern League, Quesada Swifts travelled to San Luis to play the Leopards. Quesada won on 3 rinks with the points 8-4 and the shots 90-61. The Swallows hosted San Luis Lions winning on 3 rinks with the shots drawn 84 each. So the points were Quesada Swallows 7, San Luis Lions 5. In the Winter league, Quesada played away and faced a tough side at Vistabella who won the match 10-2 and 103-69 shots. In the Federated 4’s, Quesada Panthers played at San Miguel against the Cherokees. With two of the rinks decided on the last end, the Cherokee’s won 8-0 with the shots 62-41. Another busy week, with mixed fortunes for our teams but we started on a very positive note. 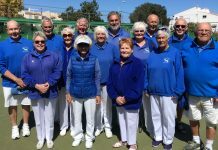 Sunday 3rd February: GREAT NEWS – OUR SAN LUIS TEAM WON THEIR PREMIER 20 K/O SEMI FINAL v EL CID, an excellent result 8-0 at home, 6-2 away; and so very nearly a clean sweep. SA League Monday 4th Klingons away v SM Alsations, a good result; 8pts-4, 89shots-74. Winners: Colin Jackson, June & Keith Jones, 18-10, Keith Phillips, Ray Clarke, Neil Morrison 20-14, William Holtham, Sabrina & Russell Marks 25-10. Trekkers away v SM Beagles, a hard fought match 5pts-7, 78 shots-84. Winners: Allen Bowen, Les Bedford, Suzi Cooper 17-17, Graham Bird, Marina Beardsall, Barry Edwards 19-16, Ros Holmes, Jan & Brian Pocock 23-13. Romulans a tough match home v a very strong SM Pointers team; 0-12, 65shots-100. Vulcans BYE. 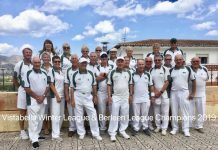 Wednesday 6th Winter League: a great result in a very close fought match, with 2 games going to the last shot of the last end, home v Javea Green, 10points-2, 80 shots-77. Winners: Pam Lockett, June Jones, Peter McEneany, Keith Jones 18-9, Kath Reid, Giuseppe Galelli, Neil Morrison, Ian Kenyon 17-16, Ray Clarke, Drew Russell, Sabrina & Russ Marks 17-15, Shirley Verity, Ray Pollock, Jo & Jules Pering 17-15. FED 4’s League: Thursday 7th Ospreys had a close result home v SM Mohawks: 4pts-4, 52shots-44. Winners: Pam Lockett, June Jones, Ray Clarke, Keith Jones 23-8. Condors BYE. Bazas away v Country Bowls, hard fought but unfortunately, 0pts-8, 39shots-60. Southern League: Friday 8th Lions away v Q Swallows, had a close battle, shots 84-84, 5pts-7. Winners: Colin Jackson, June & Keith Jones 27-11, Janet McEneany, Ray Clarke, Peter McEneany 23-11. Tigers, had a tough match away v SM Bulldogs, 68shots-100, 2pts-10, just losing out on 2 other games. Winners: Ros Holmes, Jan & Brian Pocock 18-15. Leopards home v Q Swifts, a hard fought match: 4pts-8, 61shots-90. Winners: Derek Barker, Chris Jackson, Sue Ross 20-11, Dennis Jackson, Ian Ross, Ken Dullaway 14-12. Pumas, home v EI Roundheads, another useful result: 6-6, 97shots-75. 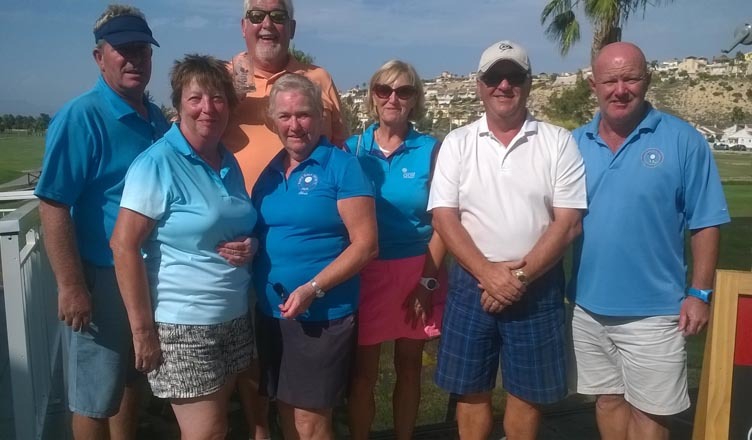 Winners: Pat Barnes, Allan Lever, Tom Fromson 34-5, Val Lever, Mary Fromson, Terry Baylis 16-12. 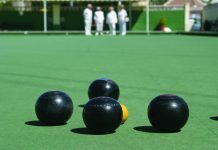 For club information, use SLBC website: www.sanluisbowls.byethost7.com or contact June Jones, Club Captain: 691903773. San Miguel Pointers had another great win playing away to San Luis Romulans gaining all 12 points (100 shots to 65) and staying 3rd in the table. The best triple were Anne Young, Dave Young and Stuart Hemmings 33 – 10. San Miguel Beagles, home to San Luis Trekkers, won 7 – 5 (84:78). The best winning trio were Don Whitney, Chris Collier and Stuart Denholm 21 -7. 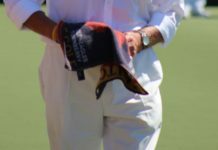 San Miguel Dalmations were away to Greenlands Maples losing 8 – 4 (79:102), the best winning trio were Stan North, Bob Graham and Frank Scotthern 22 – 16. San Miguel Alsations were home to San Luis Klingons, losing 8 – 4 (74:89), the best winning trio were Irene Ward, Gerald Shatwell and Cliff Plaisted 18 – 10. In the Winter League, San Miguel were away to Bonalba, where they shared the points 6 -6, (87:81). On the best winning rink were Allan Patterson, Bob Graham, Mary Dyer and Lin Miller, 24 – 12. This result has kept them joint 3rd in the table. In the Fed 4’s San Miguel Mohawks were away to San Luis Ospreys sharing the points 4 – 4 (44:52). The best winning rink were Bob Nesbitt, Jack Jackson, Cyril Medley and Dave Champion 20 – 15. San Miguel Apaches were home to the Emerald Isle Leprechauns, winning g 6 – 2 (57:43) and topping division B. The best winning rink were Anita Brown, Mike Douglas, Ron Nairey and Alan Campbell 29 – 11. San Miguel Cherokees were home to Quesada Panthus where they had a great win, taking all the points 8 – 0, (63:41) and topping division A. On the best rink were Brian Miller, Dave Johnson, Mary Dyer and Steve Cantley 28 -11. Finally, on Friday the Boxers were away to Mazarron Miners losing 4 points to 8 (77 shots to 81). The best triple was Bob Nesbitt, Ann Young and Barbara Scotthern winning 20-12. The Bulldogs at home had a great result against San Luis Tigers winning 10:2 (100:68) with the best rink going to John Marshall, Tom Dalgleish and Eddie Cowan, 29:12. Our Wasps sessions take place Wednesdays 1:30 for 2:00 – €5 for an afternoon’s bowling with shoes and woods available to borrow. First time bowlers are asked to attend an initial coaching session on Tuesday afternoons, starting at 1:45. 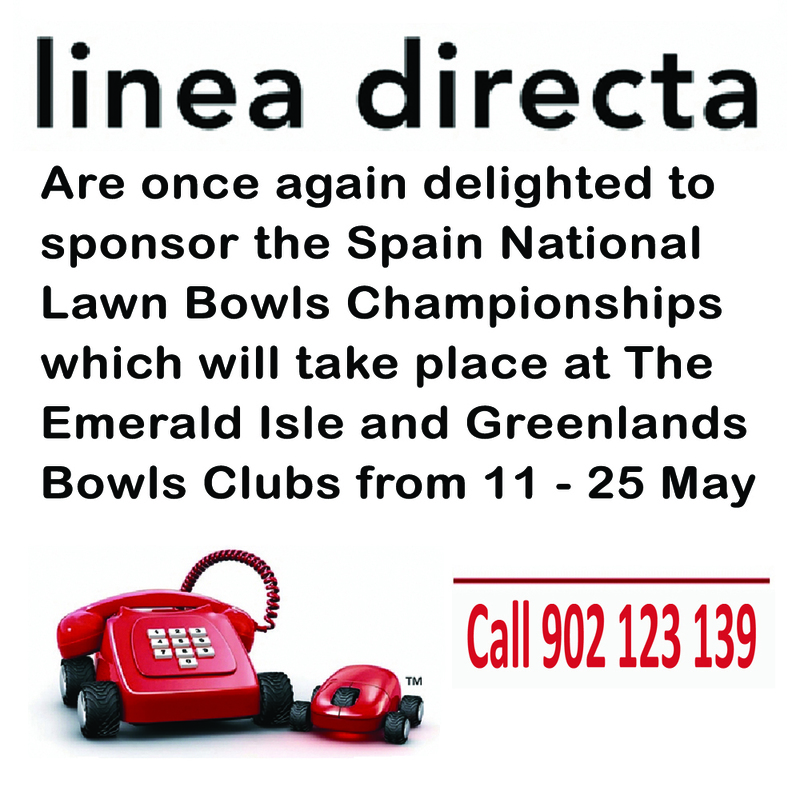 Vistabella Bowls sponsored by TV Choice & Venture Fleet. Congratulations Vistabella, we have four teams at the top of their respective league divisions…enjoy the moment and let’s strive to stay there! WINTER League. What a beautiful day in more ways than one, sunny and warm, good company and a great win! Playing Quesada at home we won points on all rinks..three wins and two draws. Still at the top of the league but quite a few games left to play….no relaxing yet! Shots, VB 103(10) – 69(2) Q.
SAL ENTERPRISE League. 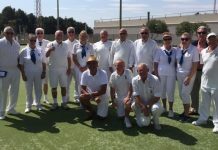 The Albatrosses were pleased the weekend gale force winds had abated, playing a good home game against La Marina Explorers they took wins on four rinks with a defeat on the fifth. Shots, VB 103(10) – 76(2) LM. The Drivers enjoyed an away win up at Monte Mar where they had three wins to the Matadors two plus the overall shots. VB 91(8) – 80(4) MM. DISCOVERY League Eagles away to La Marina Pathfinders had success on just one rink..another hard day at the office! shots, 73(2) – 96(10) LM. VOYAGER League Buggies away to the Emerald Isle Saturn’s won on three rinks, a draw on another and the fifth team lost by one shot…isn’t that maddening but still top of the leader board! Shots, VB 100(9) – 57(3) EI. SOUTHERN League A div. The Lanzadores put pressure on the Cavaliers at the Emerald Isle and picked up another ten points (that’s five weeks on the trot!) This win puts them on top of the league ! VB 95(10) – 72(2) EI. Picadors away to La Marina Ospreys won just the one game, a hard match! VB 71(2) – 10(105) LM. Div C. The Conquistadors were at home to La Siesta Silvers, a very good result of three wins plus the long game. VB 74(8) – 66(4) LS. The Swingers at home against the Country Bowls Cubs, they had wins on four rinks and the long game for a valuable ten points and now at top of the league! VB 103(10) – 72(2) CB. The home game against Greenland’s Chestnuts on Monday gave the Flamingos another valuable 10 points. Almost a complete ‘roasting’ which leaves the Flamingos handily placed in second position, albeit with the next two games being away against their nearest rivals. On Friday saw the Geckos welcoming El Rancho Broncos for an important match as only one point separated these two teams. The Geckos have been improving each week as the team become more accustomed to the consistency that is required for success in the second division. On Friday morning they excelled. Every rink determined to win and focused on doing just that. The Broncos played well but the Geckos were an unstoppable force and stormed into the lead on every rink. On one rink El Rancho came back strongly and it was nip and tuck for the last few ends, going into the 18th, the Geckos were 1 shot up. 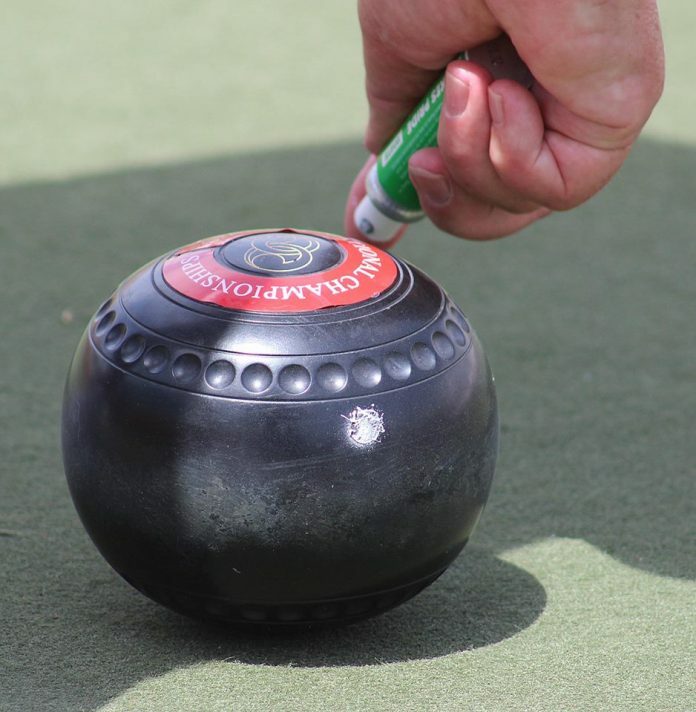 With one bowl to play by the Broncos skip the Geckos were holding 3 shots and looking to complete a clean sweep but, with the last bowl the jack went into the side ditch for a dead end and so had to be played again. El Rancho managed to end the game with one shot up forcing a draw. Great game played in a really good sporting atmosphere. 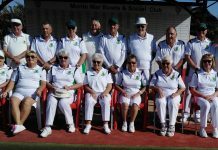 The final score gave a fantastic win to Country Bowls 11 – 1 with the shots 128 – 59. On Friday afternoon the Cubs travelled to Vista Bella to play the top of the league Swingers and they were out to improve on their last encounter together. Whilst the overall score remained 10 -2 to Vista Bella, as was the case the last time, the Cubs managed to reduce the hefty loss they suffered last time. All in all a good improvement by the Cubs. Winning rink: Chris Stevens, Craig Dyson & Andy Bryce. Monday morning found the Raiders at La Siesta playing the Pioneers and although they won just one rink, they lost a further two by 1 and 2 shots, a pretty good effort away from home. The Pintos meanwhile were playing Emerald Isle Neptunes at home and put in a sterling performance to take 4 rinks and the overall shots by a comfortable margin. In the afternoon the Palominos were also at La Siesta playing the Sputniks and put in a good effort coming away with one rink and drawing another. Friday morning found the Mustangs playing host to Emerald Isle Claymores, whilst a few struggled to master the mat, it came to all in time. The Mustangs took 3 rinks and battled hard in the other two close run rinks and taking the overall shots by a comfortable 114 to 56. Judy Foley, Henry Ryder and Bob Morgan 12-15. Ann Taylor, Jim Taylor and David Whitworth 29-3. Keith Cunningham, Malc Sykes and Bob Taylor 23-11. Irene Thomson, Paul Durham and Eddie Thomson 34-6. Ron Greenstreet, Diane Yates and Jim Gracie 16-21. The Broncos meanwhile were at Country Bowls and had a tough match against the Geckos and came away with a drawn rink and a close defeat. 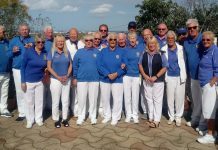 In the Discovery Division, the Sycamores were away to Horadada Falcons, final score – shots 93-79. points 7-5 Best winning rink were, Lynne Morris, John Wray, skip Tom Hill. 27-10. Also in the Discovery Division, the Maples were at home to San Miguel Dalmations. Final scores- shots 102-79. Points 8 – 4. Best winning rinks – Linda Hier, Jeff Hier, skip Derek Sale. 28 – 10. In the Voyager Division, the Chestnuts were away to Country Bowls Flamingos. final score – shots 77-113. points 2-10. Winning rink- Dave Field, Janet Bliss, skip John Dowell. 22- 20. In the Winter League we took the coach north to El Cid, final scores on the doors. 61 – 91. 2 – 10. winning rink was Brian Tomlin, Zoe Wilcock, Graham Watt, skip Jim Wilcock. 16 – 15. 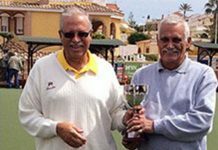 In the score – Fed 4s the Beech were away to La Siesta Hoopoes. final score 50- 54. 2-6. winning rink was Rita Hart, Zoe Wilcock, Jim Wilcock, skip Dave Webb. – 27-12. Our other team, Ash, were also in action in the fed 4s. final score, 47-53. 2-6.Best Winning rink was J Dowel, V Sale, M Kelly, skip D Sale. 21-14. In the Southern League The Cedars were at home to El Rancho Raiders. Final score – 134- 44. 12- 0. Best winning rink, P Wray, D Giddings, S Hamill. 38 – 7. The Elms were away to Emerald Isle Outlaws. final score, 73 -101. 4 – 8. best winning rink – R Hart, J Bliss, skip J Dowell. 20 – 18. The Oaks were away to La Siesta Blues, final score, 100 – 82. 10 – 2. Best winning rink were, M Stephens, J Hier, skip D Webb. 30 – 14. The final result was shots for 79 to 93 against, giving the overall shots to Greenlands. Total points for Horadada was 5 and 7 to Greenlands. Very well played to all our players. Maybe next week we’ll get that winning result. Very well played to those team members who got us the 4 points. The final shot result actually finished quite close with Horadada getting 95 to Montemar’s 101 giving them 8 points. Keep ‘em bowls a rollin’ Horadada. There’s a few matches left yet to do some damage. 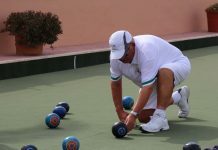 Horadada offers a warm welcome to new or experienced bowlers, and provides the necessary equipment. Our roll-up days for this friendly club are Tuesday, Thursday and Sunday mornings. Please contact Fred Trigwell on 659139129 for more information. In the Enterprise Division The Apollos visited Quesada Pearls and managed to win on the rink of Ramsay Sinclair, Brian Gardiner and Alex Morrice 18-16 picking up 2 points The overall shots going to the Pearls 135-73. In the Voyager Division both the Pioneers and the Sputniks entertained teams from El Rancho.The Pioneers winning 99 shots to 72 against the Raiders and picking up 10 points.Best winners for Pioneers were Jo Elkin, Derek Smith and Rab Logan winning 26-11 and Irene Laverick with Tony and Val Dalton winning 24-12. The Sputniks won by 104 shots to 69 against the Palaminos picking up 9 points from 3 winning rinks with 1 tied. Best winning rinks for the Sputniks were Hilary Clarke, Rod Edgerton and Alan Ralph winning 29-5 and Dot Kocsis, Ann Edgerton and Noel Morrisroe winning 30-11. Winter League visitors BBC had a convincing 99 shots to 69 win picking up 10 points.The two points for La Siesta came from the rink of Barbara Cooper,Willie McVey, Val Dalton and Florence Edwards. Both the Parakeets & Hoopoes had 6-2 wins against Greenlands.The Parakeets winning away by 53-47 whilst the Hoopoes at home winning 54-50. Best winners for Hoopoescame from Sheila Millwrd,Pat Moore, Sue Jordan and Val Dalton and from the Parakeets from Pat and Trish Reilly with Pat Harman and Jean Cooper. 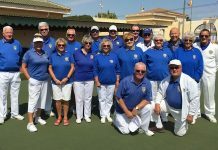 In the B Division the Golds travelled to the difficult venue of La Manga losing the match by 135 shots to 45. The whitewashed was saved by Derek Smith, Rab Logan and Alan Mawer who managed a creditable draw 13 shots apiece. Sponsored by The Pub, Bowling Abroad, Avalon, Lounge D, Rogers, La Piazza and The Belfry. Away to a very strong La Siesta team we only managed to draw on one rink. Well done to the drawing rink Paula Cleeter, Pauline Woodfine skip Barrie Woodfine. In very windy conditions the Toreadors had a good win against the Swans. 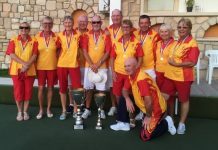 Winning on three rinks well done to Cliff Norris, Sue Bounds skip Rod Chamberlain, Dave Roberts, Bill Webster skip Mick Soars, Jan Soars, Ian Hamilton skip Graham Smyth. As expected it was a closely fought match against the Mariners. The Toreadors won on four rinks, on three of the rinks the winning margin was one or two shots. The Toreadors won the overall shots well done everyone. Shots Toreadors 85 – 81 Mariners, Points Toreadors 10 – 2 Mariners. The Matadors were away to the Vistabella Drivers. It was a hard match against the Drivers with the Matadors winning on two rinks. Well done to the winning rinks Tanya Oliver, Danny King skip Jack Burrell. Gina Hindle, Don Cleeter skip Margaret Finlayson. Phil Goble skip Dave Melville. Pauline Merry, Ronnie Cairns, Danny King skip Chris Merry and the drawing rink Jan Soars, Steve Hindle, Mick Soars skip Don Cleeter. Well done to all. A Challenge to bowlers in Valencia.